This comforting and simple to make meal is made all in one pot. 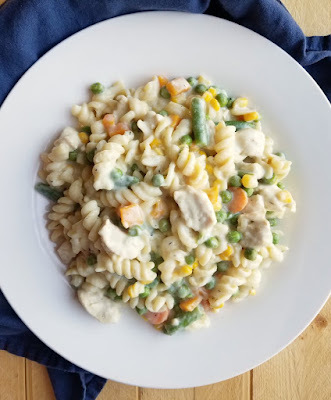 Creamy chicken and noodles is a great weeknight dinner that is full of flavor and the whole meal is in one dish! 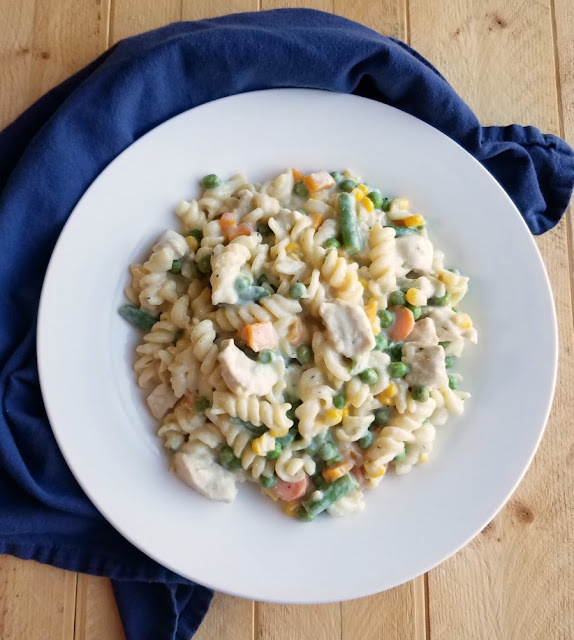 This creamy one pot chicken and noodles dinner is almost like eating a perfect chicken pot pie, but without the fuss. It is quick, easy and there is only one pot to clean when you are done. Feed your hungry family a filling and delicious dinner without any hassle. It is sure to fill them up and make them smile. I know we aren't the only ones that are feeling super busy lately. The evenings are getting shorter, there are school activities to get caught up with and it feels like the holiday craziness has already begun. One pot meals are a great way to get dinner on the table quickly and without a ton of dishes. Plus it is a great excuse to break out one of my favorite kinds of pots, a dutch oven! Food just feels cozier coming out of a dutch oven, I can't explain it. I can't be the only one that thinks so either. There's something about the pretty cast iron pot that makes it feel like it has a little extra love cooked in. Some of the items below contain affiliate links; I am a participant in the Amazon Services LLC Associates Program, an affiliate advertising program designed to provide a means for us to earn fees by linking to Amazon.com and affiliated sites. I am also an affiliate for other brands. However, I only promote things that I love and think you will love, too. See my full disclosures here. 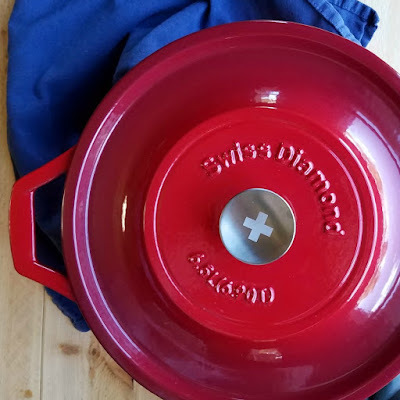 So when this gorgeous dutch oven from Swiss Diamond arrived, I couldn't have been more excited. I just knew it would be making a lot of great soups, stews and even some crusty loaves of bread. Get your Swiss Diamond cookware today! 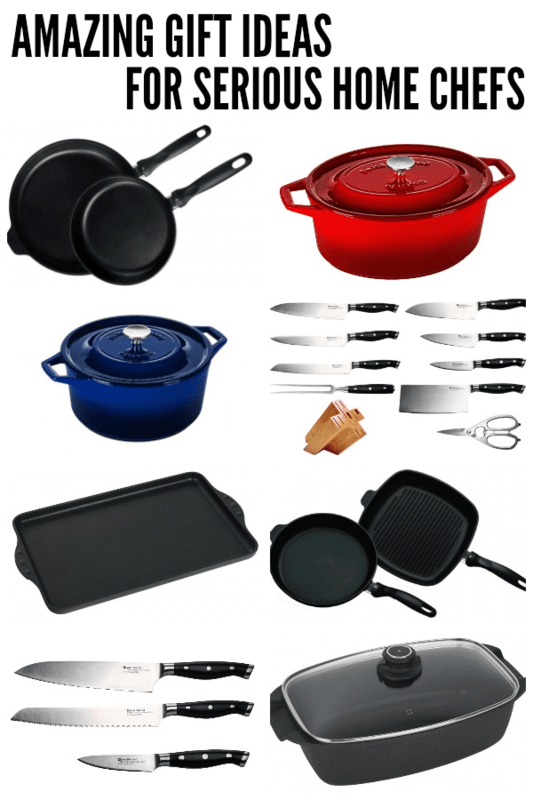 Quality Cookware with a Lifetime Warranty! The hardest part is always narrowing down what to make first! I had been in the mood for one of our favorite creamy chicken pot pies, but hadn't had the time to actually put one together. So I thought it would be fun to put together a one pot pasta meal that mimicked those flavors. And boy oh boy am I ever glad I did! 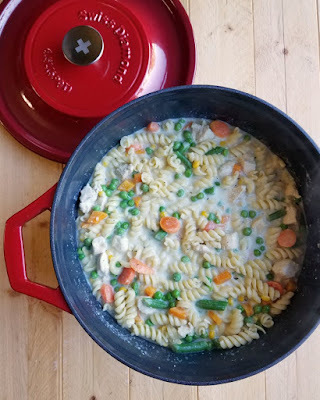 This recipe is super quick to make in the dutch oven and is so creamy and delicious. It is comfort food without a lot of effort and is a perfect weeknight meal. The boys loved it too! We all had seconds the first night. But I made enough to feed a small army, mostly on purpose. I love taking leftovers to work for lunch and these were a perfect heat and eat lunch. I am thinking of making chili in my beautiful red dutch oven next. Then some of our absolute favorite Kelly's Cheese Soup is on the agenda too. You could make this even faster by using leftover chicken or turkey. It would be a great way to use those Thanksgiving leftovers! If you don't like mixed vegetables, frozen peas and carrots would be a great option. If you don't have chicken stock, water and chicken base is a good substitute. Put oil in the bottom of the dutch oven and heat over medium heat. Add the cubed chicken and season with salt and pepper. Cook, stirring occasionally until the chicken is browned. It's ok if it isn't cooked all the way through yet. Add the onion and garlic powder, continue to cook and stir occasionally until the onion is translucent. It should just take a couple of minutes. Stir in the chicken stock, being sure to scrape up any bits on the bottom of the pan as you add the stock. Bring to a boil. Stir in the pasta and continue to boil for 7-8 minutes. When the stock is mostly absorbed, drop the heat to medium low. Just before serving, stir in the sour cream and adjust your salt and pepper to taste. This holiday season, don't forget to shop through Ebates so you earn cash back on all your purchases! The first thing I would make is the Christmas turkey. 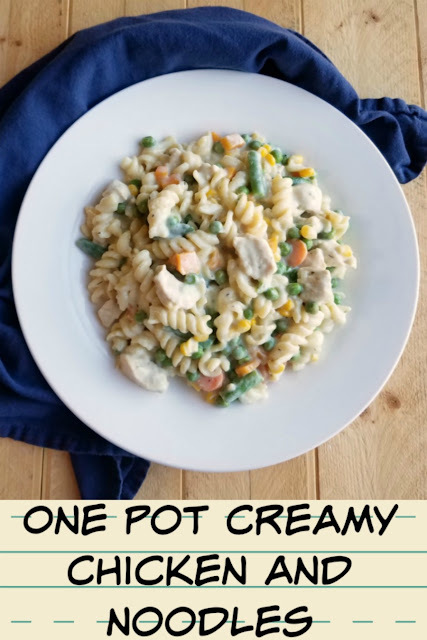 Oh yes, Gimmie this creamy goodness, one to make while the boys are home this week! Big winner friend! It would be perfect for feeding the whole gang! Carlee, this dish looks so creamy and tasty! I love all of the veggies you have packed into it. Perfect cozy meal! Actually, I would make this recipe in the Dutch oven. It looks creamy, comforting and delicious. My family will love it. Yay! I am sure they will! Roast pork with apples would be high on my list! That's on my list now too! I'd make a port roast that looks just like the one in the photo! I can imagine a pasta dinner my kids would love more! It's great for the whole family! I loooove comfort food and this looks like the ultimate in comfort! It sounds so good right now when it's freezing outside! It'll definitely warm you right up! Comfort food at its best!!! Love Swiss Diamond!!! Comfort in a bowl. Love! Your meal would be perfect for our home. Lately Grumpy and I don't get to eat dinner together, so something that would be easy for him to reheat without affecting the quality of the dish would awesome! I love leftovers, so that's a deciding factor for me too! i think i would make this recipe first!! it looks SO good. I'd make a beef pot roast! This will quickly become a favorite for weeknights! I agree, it is here already! I would try your Creamy Chicken and Noodles! Looks delicious! That would be a perfect place to start! That sounds like a heck of a plan to me! I love making roasts. I'd love to make a nice roast first! Whether pork or beef, my family enjoys a nice roast with potatoes and vegetables. I don't make enough roasts. I really should make more! 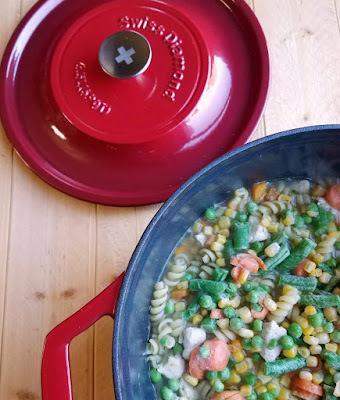 I would use the roaster for my Christmas Ham, and that Dutch oven is wonderful I would fix this recipe looks like the chicken pot pie in a Dutch oven no crust. I would love to make a roast chicken. I KNOW I would make my Christmas ham in it and then so many other dishes throughout the year! wouldn't it be so useful? This meal will definitely help take the chill off! I think I'd make your recipe! It sounds delish! Looks like such a comforting dish, and one pan always good! This looks so good! 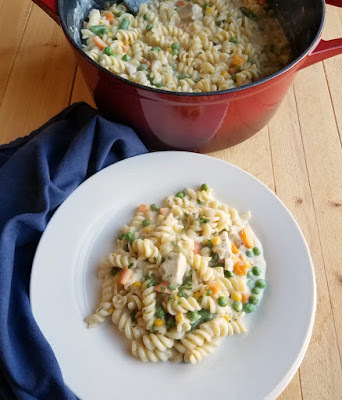 I love one pot meals and this would be a great way to use up leftover chicken. I would make a yummy roast with roasted potatoes and veggies! Thanks for the opportunity to win! Merry Christmas! I would make a roast with roasted veggies.